Interested in learning about Martial Arts? Well, you have come to the right place! NinjaPHD is your #1 resource for everything you need to know to get started in Martial Arts. From locating a Dojo near you, to learning techniques and styles, and even getting training help through on-line videos, you will find it all here. Be sure to check out our store to find the top-rated training videos on-line, so you can train from the comfort of your own home when you can’t get to the Dojo! If you are already a martial arts practitioner and are just looking for a school, training, center, or Dojo in your area, use the links below to find training centers for your style in your area. If you are just getting started and are looking for information about each specific style, you can also follow the links below to read about each styles philosophies, history, techniques, and training tips. You’ll also find important links at the end of each article that will point you to other useful information about the style. Defensive style designed not to attack, but to neutralize an attacker by using his force and motion against him. Grappling style in which the focus is heavily on ground fighting. A highly effective "fighting" style, it allows smaller opponents to control larger adversaries. Originating in Brazil, this beautifully fluid style uses acrobatics to evade attacks, while offensively focusing on kicks and punches. Highly skilled combatants will appear to almost be dancing while fighting. Ancient fighting methods of the Philippines, it was developed as a set of survival skills using common resources to aid in combat. 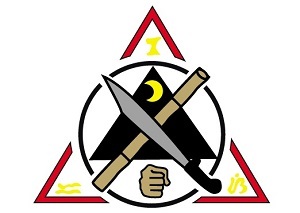 Many different specific methods fall under the umbrella of "Filipino Martial Arts". 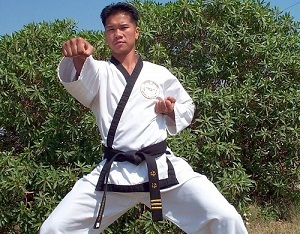 Korean self defense style in which practitioners learn how to protect themselves using throws, strikes, joint locks, and pressure points on their opponent. Hybrid fighting style influenced by Bruce Lee. Focuses on intercepting the attacks of an opponent and striking when they are about to attack. Popularized in many Hollywood movies of the 70's and 80's. 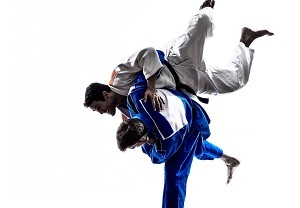 More gentle than BJJ, focus lies heavily on self-defense and blocking an opponents strikes. Originally used as a method to neutralize an armed opponent when defender was unarmed. 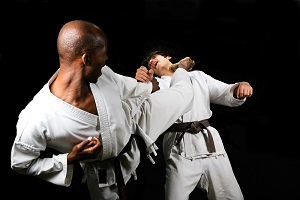 Non-violent fighting style focusing mostly on throws instead of strikes. Ideal practice minimizes the effort exerted while maximizing the impact on your opponent using leverage and balance. 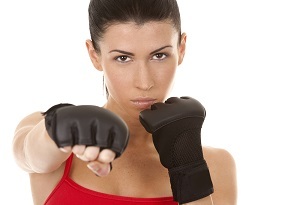 Unarmed self-defense style which uses different body parts as weapons (fists, knees, heels, palms) to escape and end the confrontation as quickly as possible. Not a true style, Kata is the detailed choreographed movements that must be learned to master many of the different Japanese style martial arts. 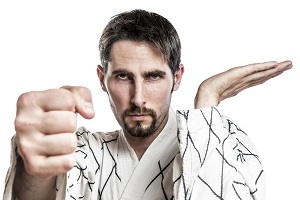 Kata is practiced individually as a exercise and meditative practice. 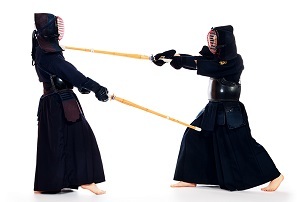 Japanese sword-fighting style that requires lots of equipment and training to practice effectively. 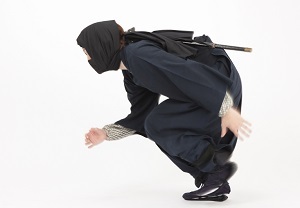 One of the oldest martial arts, practitioners are heavily armored and require stamina and endurance. General style that includes all "stand-up" combat styles involving punching and kicking. A more combative style, kickboxing allows all types of strikes, but opponents do not fight on the ground. Israeli self-defense style that teaches students to harness their reflexes in real-world defensive situations. Teaches brutal counter-attacks aimed to disable your opponent as quickly as possible in life-or-death situations. 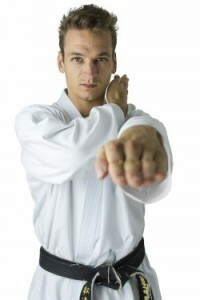 Generally a striking style, it uses blocks, kicks, and both open and closed hand strikes in defense against an attack. 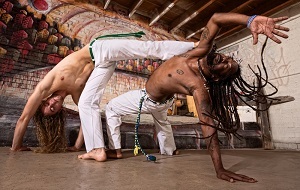 Known for it's beauty in practice, Kung Fu students may also learn joint locks and throws as defensive measures. Mixed Martial Arts draws from many other styles and focuses mainly on striking and grappling techniques in a 1-on-1 situation. 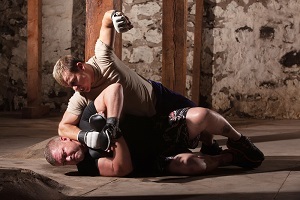 Known for its brutality and popularizes by television, MMA training is widely accessible in the US. The cultural martial art of Thailand, this style uses the body as a weapon to strike and disable an opponent while on your feet, or to spin the enemy to the ground where grappling tactics can be used. Style which focuses on the act of warfare against an adversary either during confrontation, or before confrontation. Involves numerous skills and weapons, focusing on winning a fight in any way possible. The general use of many different martial arts methods to defend against an attacker in a probably simulation. Popularized amount females, classes focus on disarming your attacker and fleeing to safety as quickly as possible. 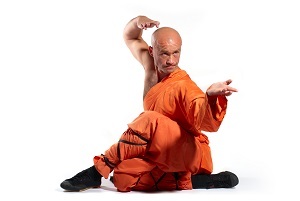 Shaolin Kung Fu was developed by Buddhist monks at the Shaolin temple in China. Easily recognized in bright orange robes, practitioners use deliberate forms to learn blocking and defensive attacking techniques. 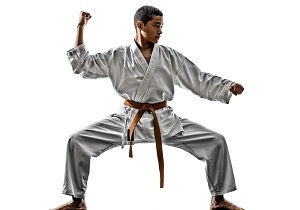 Form which uses deep long stances to enable the practitioner to strike with power and maintain balance during a confrontation. Leg strength is developed to enable speedy movements and flowing motion during combat. Korean style of fighting which emphasizes high kicks and hand strikes as defensive measures against an attack. The style also uses leg sweeps, throws, blocks, punches, and joint locks to disable an opponent. Korean martial art which draws from other forms to teach a striking style in which practitioners emphasize breathing while using moves such as wrist-grabs, punching, kicks, and blocks to defend themselves. 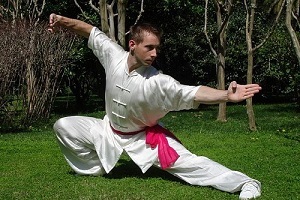 Chinese style derived from Kung Fu which focuses on effective self-defense using the fists, elbows, knees, shoulders, and feet. Involves lots of combination moves and focuses on short, fast, effective strikes. 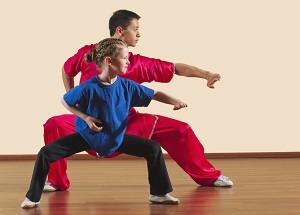 Chinese sport style which focuses on competitions in which adversaries are judged and given points for specific forms used which utilize moves, strikes, throws, sweeps, jumps, balances, and blocks. Please feel free to contact us with any questions you might have, we are here to help! Good luck as you get started on your journey towards physical, mental, and spiritual enlightenment.